Matt has been on my case to post this, I have resisted but so far that boy is RELENTLESS! I keep trying to tell him that I'm not that kind of girl, this ain't no recipe blog, and I ain't no foodie. Give me a baked potato and I am a happy little mouse. He just laughed and threatened me with physical violence. So anyway, after we hosted the fall festival I ended up with about 3 dozen apples crowding my fridge. I started frantically looking up recipes with apples, but no matter how delicious apple dumplings are there really is such a thing as too much dumplings. Then in a stroke of luck I stumbled on this recipe. Iced Apple Tea. If that doesn't scream old school southern charm I don't know what does, I feel like I should be wearing a hat and some dainty gloves. Funny thing is, the only use of actual apples is as a garnish. It is so simple, that doesn't mean I didn't manage to set off the fire alarm on my first attempt, but I have faith that you are undoubtedly better in the kitchen than I. You will need apple cider, two apples, 1/3 cup of honey, a pinch of sugar, and six tea bags. Bring three cups of water to a boil, remove from heat, and steep all six tea bags in the water for 15 minutes. Remove the tea bags, and add three cups of apple cider (I am told that apple juice works just as well, but we are cider people), the honey, and the sugar and bring the mixture to a boil again. You want to heat the tea until the honey dissolves. Pour it into your fanciest crystal pitcher that your old neighbor Dave gave you when he got divorced and wanted to start over in the kitchen. 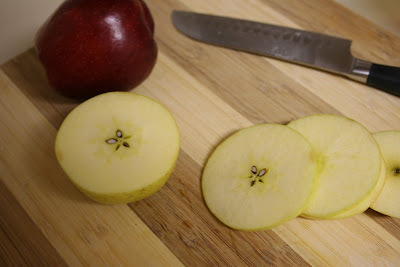 Since taking these pictures, I have learned that I like to pour it over the sliced apples, but I am pretty sure it makes so difference whatsoever. You can drink it right away if you like hot drinks, or you can refrigerate it for a couple of hours if you like it refreshingly cold. Whatever you do, DO NOT forget to eat the tea soaked apples. Matt never eats his, I don't know why, they are unbelievable. I like to pour mine into a wine glass and take on a slight southern drawl. What? You guys don't do that? Oh...yeah...neither do I. Ahem. Moving on. Now, what to do with my remaining 25 apples? Anyone? Anyone?? Apple crumble is truly delicious! You put the apples in the bottom, maybe dot them with a little cinammon. Then get flour, sugar and butter (oats if you like too) and rub it all together until it resembles breadcrumbs. Put in oven for about 20 mins ? - take out before the crumble catches fire! Delicious. Or what about baked apples. Take out the apple cores and stuff the centres with raisins and honey. Put into a warm oven and bake until soft and gooey. Simple - and truly yummy! holy yum! must must must try! Great recipe, I am going out to pick some apples, [ from the store ]. That's looks very yummy. I must try it. Glad Matt threatened you with violence and had you post it. Mmmmm.... That sounds fantastic! I like ladyfi's ideas. I'm going to have to try all of these! Or you could just chop up the apples (peel first) and cook them down on low heat ( a splash of water, a dash of sugar) and voila! applesauce! That sounds quite delicious! Thanks. Physical violence ? HAH! He trembles in your presence! And beside that I would have to remove vital portions of his anatomy if he ever hurt you! But seriously, this stuff looks great! NAd I love MATT!